The Legend in Art. 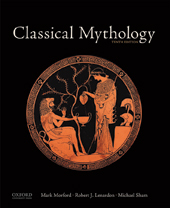 Episodes from the saga appear fairly frequently on Greek vases, and mention has already been made of the vase by Douris (ca. 470 B.C., now in Rome), which is the only source for Jason’s being swallowed by the dragon. At the end of the fifth century B.C. a vase (now in Cleveland) by the Policoro painter depicted the final scene of Euripides’ Medea, showing Medea leaving Corinth in her chariot, which is framed in the rays of the sun; Jason remonstrates below, while the dead children lie on an altar. The Etruscan bronze urn known as the Ficoroni Cista (late fourth century B.C., now in Rome) is incised with the scene of the defeat of Amycus in boxing by Polydeuces. Among the many representations of Jason’s deeds, the oil-sketch by Peter Paul Rubens (ca. 1636: now in Brussels) entitled Jason Taking the Golden Fleece is remarkable. A century later (1746) the French artist J.F. de Troy designed a series of tapestries on The History of Jason: the scene of Jason Swearing Eternal Fidelity to Medea (now in London) is a distinguished example of the many works that are based on the romantic embellishments of Apollonius. In recent times Euripides’ Medea has especially fascinated artists. The threatening power of the foreign princess is conveyed in Eduardo Paolozzi’s Medea (1964, now in Otterlo, Netherlands) an abstract metal sculpture of machinelike aluminum parts welded together.